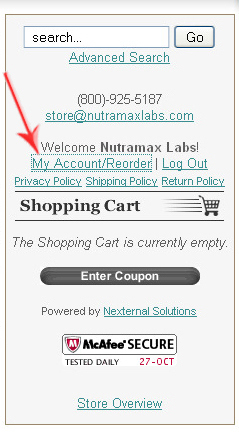 by Nutramax Laboratories Veterinary Sciences, Inc.
For a brief overview of the store, please click here. Customer Service at 1-888-886-6442 during the hours of 8:30 AM to 5:00 PM ET, Monday through Friday. We at Nutramax Laboratories Veterinary Sciences, Inc. understand your concerns about the security of online transactions. Therefore, our site is equipped with the most advanced Secure Socket Layer (SSL) technology available to ensure the privacy of any information you submit through this site. If you wish to receive promotions, special offers, and new product information from Nutramax Laboratories Veterinary Sciences, Inc. Please click here. Here is a brief overview of some of the features you can now use on the Vet-EZ-Order Store. You can now Drop Ship when you order through Vet-E-Z Order. Drop Shipping is now available through the Ship To (add new) feature. Just enter the quantity you want, and then choose who to ship it to. By default, the order will ship to your address. 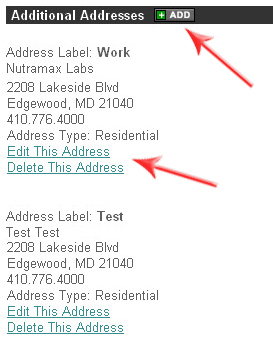 However, if you would like to send an order to an alternate address, click add new and then add to cart. A pop-up window will appear to add the person's/client's name. When you have finished shopping, click check out, and you will be asked to provide the "Ship To" person's address. CAUTION: If you cancel the order, you will need to re-enter the information. You may add Drop Ship information under Additional Addresses before you begin to order by clicking on MyAccount/Reorder. To update your account information, including changing your password click on edit under Contact Information. If you are new to the Vet-EZ-Order store or have forgotten your username and/or password, please call Customer Service at 1-800-925-5187 during the hours of 8:30 AM to 5:00 PM ET, Monday through Friday.